October | 2005 | Nauval Yazid & His Words. to remind us that to forgive one’s mistake is a habitual activity one must do on daily basis. to brighten the people who seek for a chance to be, well, known. do you love your beloved partner or companion on the day itself? i’m not going for that, definitely. “the artificial spirit has long gone. no more hassle of being stuck on an endless traffic jam. yet it feels more peaceful to be contented with myself, physically. over insecurities i’ve been carrying with me, psychologically. but when i sit down, chanting “allahu akbar wa lilla ilham” while looking at children next to me, holding tight a new piece of 1000 rupiah note, i can smell the scent of recently bought sarung he’s wearing, i can see the bright spark of his eyes, knowing that soon he’s gotta move around one big circle to say “maaf lahir batin” to his grandpa, grandma, aunties, uncles, mom, dad, and finally his fellow cousin. whatever and whichever your hari raya may be, here’s to forgive and forget the hatred, the slap and the bitchings, while to accept the serenity living with other human beings innocently, naively, wholeheartedly. whoever says that lebaran is an easy festive season? There are times when we wish to see a film in cinemas instead of getting even with small size of our television screen. We may quick to list these films worth going to cinemas for, which obviously will be filled mostly with big-blockbuster films, those with overused CGI effects, or panoramic cinematography, or crisp clear of clinging swords in any martial arts flicks. 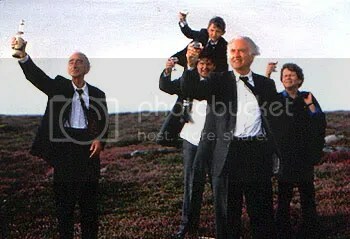 However, I heartily propose a film entitled Waking Ned Devine as a film worth every single of our hard-earned dough. Why do I bother bringing in the film about a lottery winner who dies before collecting his winning, and turning his neighbors in plotting a scheme to outlive the money? Spare for a few minutes of gorgeous view of beaches in (supposedly) Ireland that makes us wish to live there, for most of its 90-minute duration we only see British and Irish’s finest aged thespians, without any girls in scantily clad bikini running around. But more than that, we will see at least two old folks don their birthday suit, while riding on a motorbike nevertheless. That only counts for a few scenes from many other hilarious ones you find yourselves laughing out loud throughout this heartwarming flick. Now imagine, if you are laughing together inside a darkened hall with strangers whom you have nothing in common except the share of laughter towards the same object seen at the same time, and leaving the cinema feeling good, knowing the last one and half hour is spent jolly well. Movie magic certainly does come very rarely, only in a film like this. dan ada dari kita yang bertaburan kemilau bintang senyawa langit malam. kenapa cinta harus diujungi dengan duka kalau ia berawal dari suka? jujur aja, sekarang ini saya lagi miskin yang berasa kaya. gimana ngga miskin kalo ngga ada pemasukan. duit dari mana? ada sedikit sisa tabungan dan hasil kerja terakhir yang pas buat bayar kebutuhan pokok seperti uang rumah, utang komputer, listrik, air, telpon, dan makan a la kadarnya di hawker centres. tapi jangan ajak saya pergi makan di restoran sekelas burger king pun, atau mengobrak-abrik cd di gramophone, atau nonton film di akhir pekan, dan juga pergi ke beberapa festival film yang sedang berlangsung. untung saja festival film perancis kali ini tidak memutar “hidden” nya michael haneke, karena kalau saja mereka berani memutar film ini, saya pun berani berhutang mati-matian, kalau perlu ngantri mati-matian di depan counter sistic. tapi di tengah banyaknya waktu luang saya, ada perasaan bergetar setiap kali saya pergi ke esplanade library, dan melihat tumpukan buku tentang film yang berjejer rapi menjulang tinggi di depan saya yang kecil ini, baik secara fisik ataupun mental. seolah-olah mereka berkata, “come, read me this time”, walaupun tetap untuk urusan screenplay, saya masih ingin menuntaskan semua buku dari syd field sebelum pindah ke pengarang lain. seperti layaknya juga beberapa buku pauline kael, pahlawan kritikus film yang saya hormati karena selalu jujur dalam menulis review tentang film-film yang pantas dia review. mungkin anda bingung kenapa semua tulisan saya tentang film. jangan khawatir, meminjam penggalan lirik dari seurieus yang terlalu sering digunakan, nauval juga manusia, punya rasa, punya hati. hanya saja, rasa dan hati saya tidak bisa memungkiri bahwa dia suka menonton film, suka menulis tentang film, bahkan tidak malu-malu mengakui bahwa satu-satunya mata kuliah dulu yang rajin saya datangi baik lecture maupun tutorial nya adalah mata kuliah american film. menariknya, mata kuliah ini adalah mata kuliah pilihan (minor), yang berarti bukan termasuk mata kuliah wajib dari dua jurusan (majors) yang saya ambil waktu kuliah di nus dulu. dan inilah kecanduan saya yang mulai harus diatasi. hari-hari saya diisi dengan nonton film lewat dvd yang dipinjam dari esplanade library (sekali lagi, jangan suruh saya pinjam di tempat peminjaman dvd umum seperti videoezy, karena alasan finansial), dan setelah film itu selesai masa putarnya, maka saya akan duduk dan berpikir di depan monitor komputer untuk kemudian mencari informasi tentang film ini, dan memutuskan apakah si film layak untuk dianalisa lebih lanjut. sayangnya, obat penyembuh kegilaan ini tidak ada. kalaupun ada, bentuknya hanya berbeda sedikit, yaitu saya tetap menulis, tapi tentang sesuatu yang lain. sekarang ini saya lagi getol menulis tentang acara-acara di singapore yang berkaitan dengan lebaran, karena mau ngga mau, artikel inilah yang bisa saya tawarkan ke media massa. tapi saya tetap percaya kalau dalam waktu dekat, saya harus menulis tentang film, dan tulisan-tulisan itu harus dipublikasikan ke masyarakat luas. saya tidak mau pernah berpikir apakah pembaca umum mau mengerti, atau bahkan hanya sekedar untuk membaca, karena itulah kepuasan saya pribadi. jaman ini banyak kompromi, susah sekali mencari kesenangan diri. By now you have noticed how my writings on film appreciation have differed to some other kind which I myself do not possess any control on the change. Of course the notification only applies if you are that faithful in reading this blog consistently, in which the idea itself frightens me out. If you are on the opposite side, I extend my gratitude and welcome you, indeed. The change itself pretty much is easily identified on how I have recently often dwelled on absorbing the whole impact of the film. In other words, it is what I feel afterwards, what my heart says after the credit title finishes rolling, and I can sit in front of this monitor to pour out every single initial sensory reaction to the films I have just seen. By any means, this kind of writing would usually put aside technical matters or basically the elements that make the film works, for example, some technical flaws on cinematography, or inadequate music scores, or the one that I talk about most is actors’ performances. Not that I see myself capable in delivering in-depth discussion about that, yet I always find the tryout in touching those mentioned factors appealing, and to some extent, intriguing, as well as challenging my mind to think those through. However, tonight I have decided to return to the so-called root, as one film has awakened, or rather tickled my curiosity in examining the ‘outer’ look seen on a screen. The film is Shadowlands. In a nutshell, the film tells the story of that famous author, C.S. Lewis, and his marriage to an American woman, a poet, named Joy Gresham. The characters did exist in real life before, therefore it is aptly called that the film is based on a true story. This will lead to general understanding among smart audience that no matter how the film is mirrored after events ever existed before, certain aspects of exaggeration in the name of dramatic purpose is needed to make a film worth watching. Therefore, is it necessary to put the words “This is a true story” on the very first scene of the film? Having already seen that on a screen, as audience we are led to believe by the director (none other than Sir Richard Attenborough of Gandhi fame) that he guarantees what we will see for the next 127 minutes are exactly what the couple did on their lifetime or the ways they behaved towards each other is guaranteed real to a maximum effect. The result could not be more disappointing than seeing the screenplay full of worth-quoting wisdoms has become something of half-baked done. 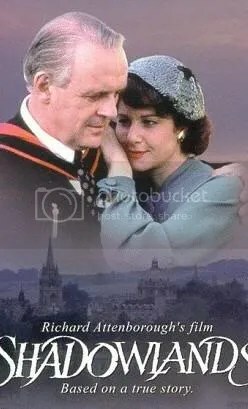 Surely the main actors, Anthony Hopkins and Debra Winger, have delivered their excellence, yet the problem of their convincing portrayal of ill-fated couple lies on our perceptive towards them. In other words, their convincing portrayal fails to convince us in thorough comprehension of their love story. In particular, Winger on her Oscar-nominated role here was given a character with many possible deeper exploration in seeing her gracious falling from a strong-willed, independent woman, to become a woman who has to compromise her unfortunate condition while doing her best to provide affection to her partner in life. Yet, the falling on her character is badly translated as the falling of her screen presence, in which after a good knockout for the first hour in the film as a leading role, she is reduced to become some supporting player. Worse, I begin to think that the last hour of the film, we see Winger’s role has become a damsel in distress, only to be puffed with lavish look of 1950s gorgeous costume and panoramic view. Luckily, being a consummate thespian on her own, Winger carried her duty amazingly well, although it is a pity to see the butchering. Hopkins himself might not see his presence reduced to a mere filler of the screen unlike his compatriot. How can it be when his face occupied most of the film? Yet, his inhibition of character leaves us bedazzled in wonder and confusion, as often we find the character’s change is something forced to happen. As a famous writer himself, C.S. 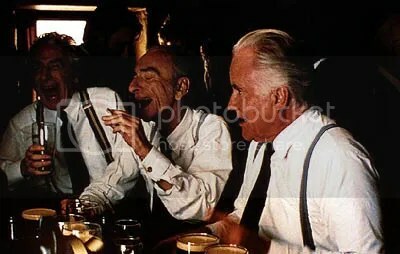 Lewis might visit his sentimental feeling in order to emphatize with his own suffering, yet as a noble man with dignity, a weeping scene that lasts for more than ten seconds would only make audience thinking that the old man is a meek, weepy senior citizens who should be back in his emotional reclusion. Talk about the backlash of intended depiction. I sincerely hope by now you do realize that whenever a resourceful literary works is adapted into a big or small screen, it is no easy feat to capture the truest essence of the works being adapted. Worth-quoting wisdoms, mottos, or any symbolic words are not able to hold on their own unless they are transformed as a coherent screenplay which allows us, the audience, to see the development of characters convincingly, thus we are convinced that whatever we witness in the screen is a journey worth taken, and remembered. some films catch you off guard, where you are taken to completely a new world while you are still maintaining a good contact with the film you are watching. this does not mean your concentration deters away from the film, but rather, the film strikes you hard and you can’t help wandering for a good minute or two, because unexpectedly, you feel the film completely with all your senses. and hedwig transports me to the heartfelt experience. not being merely contented with my own emotional involvement, the jolly feeling also comes in noticing how this film has set a certain barrier on making a good rock-opera film. there’s a struggling and to some extent painful journey the main character goes through in his life before coming to his own terms as a singer, a musician, or greater, an artist. this journey then is translated on the words and tunes, to be sung out, played, or greater, appreciated. perhaps the latter might come later towards the end of this artist’s life, because a biopic does not befriend young rising stars after all. but the main thing a rock-opera film should possess apart from continuous rock songs filling in throughout the scenes is the honesty, and consistency. alright, that’s already two elements, but they can’t be more inseparable from one another. hedwig excels in frankly telling us the journey of his life through the lyrics in all the original songs being sung out in the film, making us feeling like witnessing directly his presence in front of our eyes. if such an honesty comes out with catchy tunes enable us to sing along, that’s purely a bonus in store. yet, a greater effect of these unpretentiousness results in a certain constancy maintaining the rock-and-roll atmosphere, as perhaps initially intended by the filmmakers themselves. never a scene slips out of tunes leaving us unhooked, and never a moment shies away out of focus from putting the spotlight on hedwig and his angry inch. to have a film that is brutally honest and lyrical at the same time, one can only be thankful and be more than ready to have its own heart wrenched over this meaningful film.